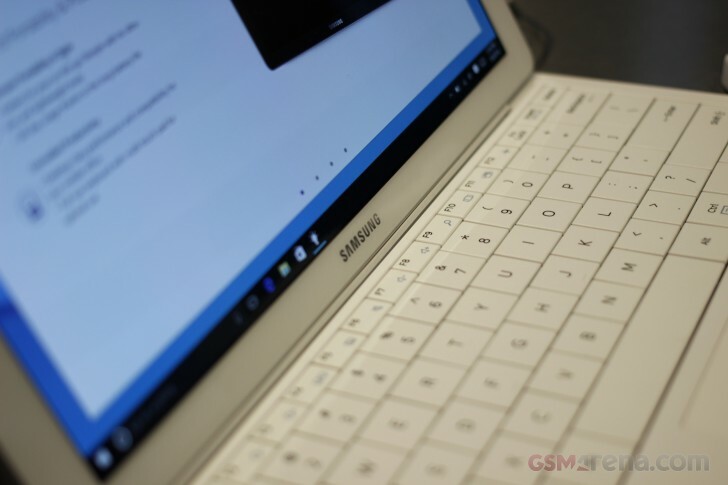 Samsung's surprise Windows 10 tablet, the 12-inch Galaxy TabPro S was announced a couple of days ago at CES, but there was no word on pricing. That blank gets filled now, with information coming our way from Germany. According to All about Samsung the base model with Wi-Fi-only connectivity and Windows 10 Home will set you back €999. The Pro version of the OS adds another €100, and then LTE cellular support commands and equal premium, so a TabPro S with Windows 10 Pro and LTE is €1,199. At least the keyboard is included. The article doesn't specify which of the two SSD options (128GB/256GB) is concerned, but a quick check on Amazon.de says 128GB=€999. It's the only option listed so far on the retailer's website. Logic would dictate that doubling the storage will likely push the top-model's price in the whereabouts of €1,299 or even more. Meanwhile the Surface Pro 4 with an Intel Core m3 CPU, 128GB SSD, stylus in the box (an option for the TaPro S), and Windows 10 Pro is listed at €999, but then it's no AMOLED, and the keyboard is an extra €120. Decisions, decisions.